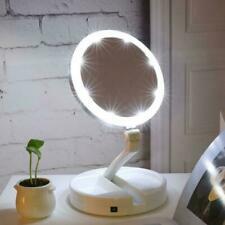 Auraglow 10X Magnifying Shaving/Makeup Beauty Mirror with LED Light and Fully Rotatable Locking Suction Cup, Wireless and Battery Powered. This mirror is the ideal solution for shaving or applying makeup. 1 x 4M LED vanity mirror strip. LEDs Quantity: 240. 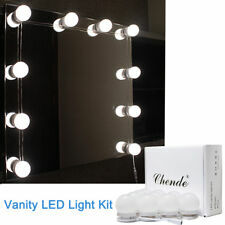 Features:Built-in 36pcs LED bulbs, which it is safe to eyes and adjustable of the brightness by LONG PRESSING sensor switch.1X flat mirror with 2X 3X and 10X magnification spot design.Makes sure every detail of your hair and makeup perfectly in place, especially working well for eyeliner, eyebrows, etc.180° free rotation design, can be fixed at any position to give you the perfect viewing angle.With triple folded and base&nbs. Want to have delicate makeup that looks natural and flawless?. 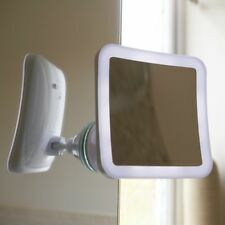 I guess this 10x magnifying vanity mirror will be of great help for you! This 10x magnifying round mirror has an elegant design with foldable function. Size: 20CM disc, suction cup 8cm, gooseneck length 26cm. The 360 degree swivel swivel arm can be adjusted to any angle you want. 2.10x magnification to help you see the details of your face. 1 Makeup mirror. 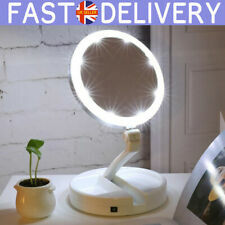 LED-illuminated 10x magnification Travel Double Sided Makeup Mirror My Fold Away UK SELLER FAST DISPATCH Description Brand new and excellent quality LED-illuminated 10x magnification Double Sided Travel My Fold Away Makeup Mirror Super bright LED lights on both sides for picture perfect illumination. Made from distortion-free glass. Lightweight and compact for travel. 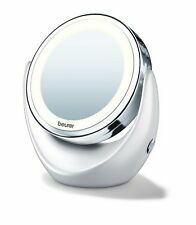 Rotates to a powerful 10x magnification mirror. Extends to a full 13" high, yet folds for convenient storage. Product Name: LED folding mirror - 21 bright LED lights Product Material: ABS acrylic Production process: plastic injection color Packing: PE bag ordinary safety packaging plus hard box Use: Suitable for daily home, bathroom bedroom. Product Description: Simple shape, folding, easy to carry, can adapt to each crowd. Press your fi n ger on the power switch circle on the mirror panel, the mirror will be lighted. 1 x Makeup Mirror. 140ML Oil Aroma Diffuser Ultrasonic Humidifier Air Mist Aromatherapy Purifier. 1:1 HD Mirror. You can power up LED lights that will illuminate both sides. Rotates to a powerful 10x magnification mirror. Super bright LED lights on both sides for perfect illumination. 1pc 10 x Magnification Mirror. As well as folding inwards, the mirror rotates 180° so you can get great visibility in every area of your face - ideal for precise jobs like winged eyeliner or eyebrows. • Classic Hollywood-style trifold LED lighted mirror with 10 X magnifying side mirror – apply your makeup to perfection even in poorly lit areas. |Flexible arm and strong suction cup: 360° rotatable design allows you to position the makeup mirror anywhere at any angle you want easily. |Powerful 7X magnification: It allows you to see every detail of your entire face. Mirror is double sided, one side is a regular mirror and the other has 3 x magnification. 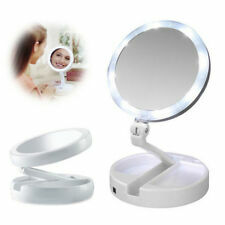 Double sided LED light mirror: one side for 7X magnification mirror and reverse side for 1X regular mirror. When you press the button, all LED beads lights on and provides you a natural light effect.